Glogirly is gone at Barkworld, the pet blogging and social media conference for ... yeah, DOGS. Today's Saturday Photohunt theme is *SPOOKY. * Fitting. I figure this oughta spook her out. EEEEEK! *paws to heart* don't SCARE us like that, Katie! That is spooky. It made our little hearts hammer! Either that, or just the thought of you bein in jail, Katie! GEEZ, Katie, you SCARED me! You're not in disguise 'cause your on the lam, are you? This is just not SPOOKY , it´s freakin SCARYYYYY !! I like your non-spooky pink mask, Katie. Very scary. Good luck with the contest, we voted for you. Never knew pink can be spooky. Go Katie! purrr...meow! 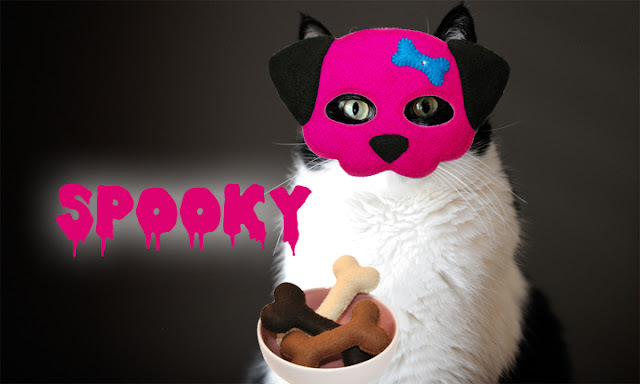 A cat holding a bowl of dog biscuits??? Grete woofie is doing a dance! She'll be right over! Me hopes the human brings some cat stuff home from Bark world. Katie, you've gone over to the Dark Side! Whoa! That's scarier than Chucky! Even scarier than than Foto bombs we posted this week. YIKES, Katie! That is spooky! !